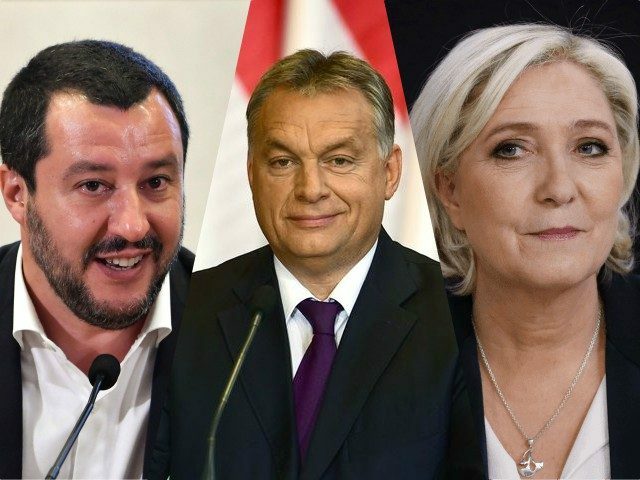 Fresh polling show a massive surge in support for anti-mass migration populist parties in France, Italy, and Hungary with the pro-sovereignty parties now leading their rivals going into next year’s European Parliament election. A Hungarian national poll released earlier this week, conducted by Medián, shows Fidesz, the party of Prime Minister Viktor Orbán, along with their Christian Democratic People’s Party allies, to have increased their already huge lead over their rivals to a total score of 63 per cent, with the second most popular party Jobbik at a mere 11 per cent. In Italy, the popularity of populist Interior Minister Matteo Salvini continues to see the League dominate the polls where the party has consistently outperformed their coalition partners, the Five Star Movement, since July. Salvini has been shown to be the most trusted politician in Italy according to a poll from the Giorno newspaper released in July. The Five Star Movement and its leader Luigi Di Maio, meanwhile, have struggled to implement their economic reforms which include a basic citizen income due to pushback from the European Commission. A Noto poll shows the League at 31 per cent, four points ahead of the Five Star Movement at 27 per cent and 13 per cent ahead of the mainstream Democratic Party. In France, the popularity of President Emmanuel Macron has plummeted in recent months to an all-time low of only 21 per cent in a poll released last week. The drop in popularity has also had a knock-on effect on Macron’s La République En Marche! (Republic on the Move/LREM) which now trail behind the populist Rassemblement National (National Rally/RN) led by presidential runner-up Marine Le Pen. The next major election for all three countries will come in May next year when the members of the European Union vote in the next European Parliament election. An Elabe poll for the parliament election also shows the RN with a slight lead over Macron’s LREM. The polls also come after alliances have formed between the conservative and populist leaders in Hungary, Italy, and France. In August, Mr Salvini met with Prime Minister Orbán as both pledged to form a populist front against the globalists in the European Union aligned with French President Macron. Last month, Salvini met with RN leader Marine Le Pen in Rome and announced the prospect of a “Freedom Front” to unite the populists in the European Parliament. With some calling for Orbán and Fidesz to be kicked out of the conservative European People’s Party (EPP) parliamentary group, the prospect of an Orbán-Salvini-Le Pen alliance could become a reality.